Newspaper Fiction: Based on a True Story! Write a short, fictional story based on a newspaper article. Students learn how to produce their own newspaper about ecology and recycling. 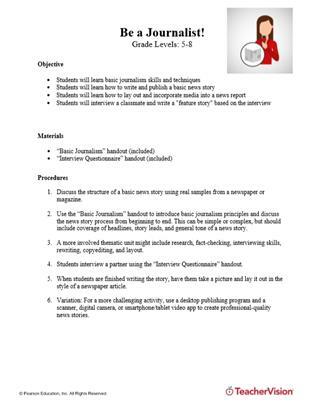 Print a worksheet that outlines ways to make a newspaper reader-friendly. Students practice writing newspaper headlines and identifying parts of speech.